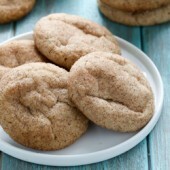 Classic snickerdoodle cookies made egg free, with the perfect balance of crisp and fluffy texture! Cream together butter and 1 cup granulated sugar until light and fluffy. Add milk and vanilla, mixing until well combined. Scrape bowl as needed. Mix in salt, baking powder, 1/2 teaspoon of cinnamon and cream of tartar. Add flour in 1/2 cup batches until fully incporated. Transfer dough to a clean bowl or storage container. Chill thoroughly, 2-4 hours or overnight. Alternately, dough can be placed in the freezer for 30-45 minutes or until firm but scoopable. Dough should be firm before continuing. In a small bowl, combine remaining 2 tablespoons sugar with 1/2 teaspoon cinnamon. Use a small cookie scoop to scoop dough. Roll into a smooth ball and coat well with cinnamon-sugar mixture. Transfer to prepared baking sheet, spacing cookies 2-inches apart. Return any remaining dough to the refrigerator to chill between batches. Bake for 10-15 minutes, removing when desired crispness is reached. Immediately remove to a wire rack to cool completely. Adjust bake time for desired crispness.